Across the country the growth of inflexible costs such as state assessments, debt service and pension payments have put pressure on the departmental expenditures of municipalities. That situation is no less true for the City of Boston. 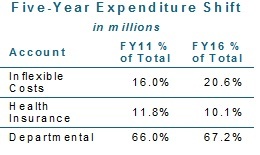 From FY11 to the current FY16 budget, Boston’s inflexible costs have grown as a share of the total operating budget from 16% in FY11 to 21% in FY16. 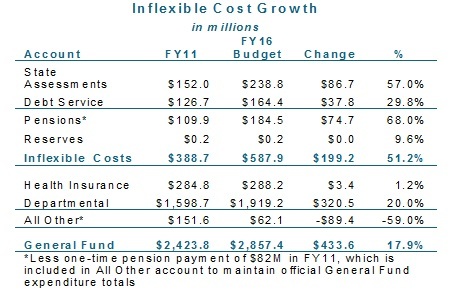 During this five-year period, the inflexible costs have grown by 51.2% compared to departmental spending growth of 20% and overall General Fund operating growth of 17.9%. The City has been able to manage the growth of health insurance expenses to 1.2% over the five-year period though negotiations with the insurance providers and the public unions, limiting further diversion of resources from core departmental services. The largest increase of inflexible costs is due to the growth in state assessments, which are mainly charges for MBTA services and the tuition payments to Commonwealth charter schools. The annual growth of the MBTA assessment cannot exceed 2.5% under Proposition 2½ unless new services are provided. The charter tuition assessment is based on the Ch. 70 education aid that follows Boston students attending Commonwealth charter schools and has grown by $79M or 115.7% in the five years since FY11. The City has an outstanding pension liability of $1.69B. The City remains committed to a schedule of reaching full funding by 2025, which is expected to require an annual appropriation increase of 7.75%. This rate outpaces annual revenue growth, but when the system reaches full funding in 2025, the annual payment will be reduced by approximately 70%. Those freed-up funds then could be applied to address the City’s $2.1B retiree health insurance (OPEB) liability. Debt service payments finance the City’s principal and interest for capital expenditures. The City’s debt service standard is 7% of the operating budget, but actual debt service is budgeted at 5.2% in FY16.